Whether you're remodeling your entire home or simply wish to add a bit of light to a room, no form of lighting is as classy and well-integrated as recessed lighting. Recessed lighting is artfully placed within a wall or ceiling and as such works gracefully to light up any room. Recessed lighting can add to your home's aesthetic appeal by eliminating the need for bulky, protrusive fixtures. At Direct Energy Home Services, we offer numerous options for recessed lighting installation. We'll help you design an elegant recessed lighting system for as many rooms as you require. How can I improve the light in my home? Indoor lighting is a key part of interior design and can make a house truly feel like a home. It can also be an intrinsic component of landscaping. 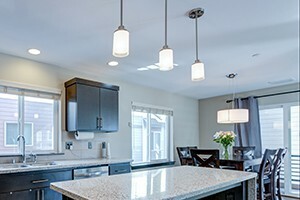 However, lighting represents a major component of energy consumption, therefore, proper residential lighting installation can save you money and conserve natural resources at the same time. Accent Lighting - is mainly decorative, intended to highlight pictures, plants, or other elements of interior design or landscaping. General Lighting - fills in between task and accent and is intended for general illumination of an area. Indoors, this would be a basic lamp on a table or floor or a fixture on the ceiling. Outdoors, general lighting for security and specialty lighting purposes is used. Interior Lighting - Interior lighting systems are one of the most effective ways to increase the safety and security of your home. A well-lit house is a deterrent to any intruder, so criminal activity is less likely to occur. You will have peace of mind and can feel safe knowing that you are coming home every night to perfectly lit home. Incandescent Light – Incandescent light bulbs are a source of electric light that works by incandescence (a general term for heat-driven light emissions). Electric current passes through a thin filament, heating it until it produces light. The enclosing glass bulb prevents the oxygen in the air from reaching the hot filament, which otherwise would be destroyed rapidly by oxidation. Compact Fluorescent – Compact fluorescent bulbs use less power to supply the same amount of light as an incandescent bulb. The light of a compact fluorescent is emitted by a mix of phosphors on the inside of the tube, which each emit one color. Modern phosphor designs are a compromise between the shade of the emitted light, energy efficiency, and cost. Fluorescent – Fluorescent lights or tubes are gas-discharge lamps that use electricity to excite mercury vapor. The excited mercury atoms produce short-wave ultraviolet light that then causes a phosphor to fluoresce, producing visible light. While larger fluorescent lamps have been mostly used in large commercial or institutional buildings, you still find them used in garages, kitchens and recreational rooms in the home. Compared with incandescent lamps, fluorescent lights use less power for the same amount of light, generally last longer, but are bulkier, more complex, and initially more expensive than a comparable incandescent bulb. Some of the interior lighting solutions we offer include: recessed, under cabinet, art lighting, pendant lighting, track lighting, up and down lighting, niche lighting, chandelier, sconce and alcove lighting. One of the most common choices in exterior illumination for homeowners is outdoor security lighting. Keeping an area well lit at night goes a long way as a deterrent to help keep intruders and burglars away. Brightness and motion sensors are the two main characteristics to consider when choosing outdoor security lighting, to provide you with a feeling of safety and comfort for you and your family during the nighttime hours. Another choice for exterior lighting is decorative, used to illuminate walkways, plants, shrubs, and trees and provide ambiance to a yard. Some of the exterior lighting solutions we offer include: floodlights, security lighting, post lights, porch and coach lighting. To learn more about indoor lighting and outdoor lighting features, call a Direct Energy Home Services electrician to evaluate your needs. We specialize in residential lighting installation and can help you with practical and aesthetic projects for your home. Installation is prompt and efficient and best of all, we are fully licensed, insured and prepared to undertake all jobs big and small.